Truth be told everyone...I've been having a hard time getting back into the swing of things in the kitchen and with the blog post-holidays. Does anybody else feel somewhat adrift? ...No? Just me? Ok that's cool. I'll do better y'all, pinky promise! Now...this is a pretty classic Kayle recipe--there's potatoes...and there's carbs. 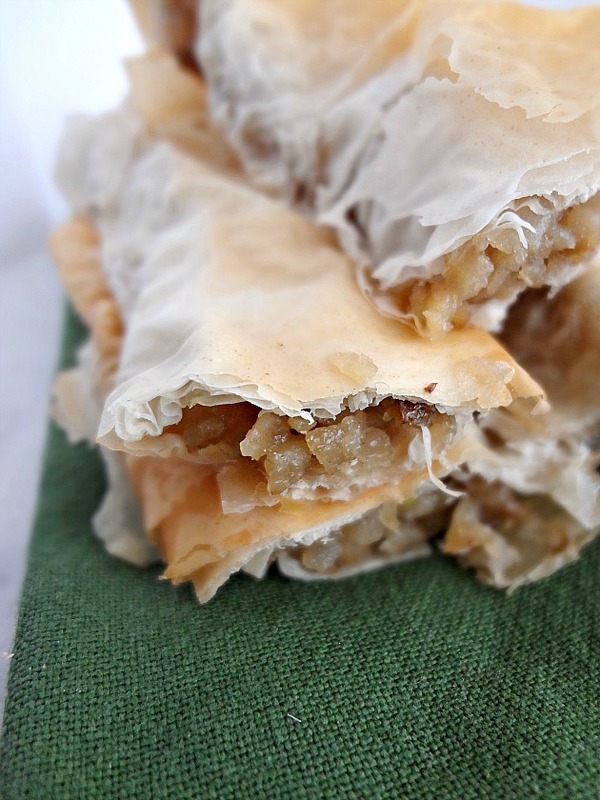 But it's fun and different and kinda classy (I think) because flaky and delicious phyllo dough is wrapped around shredded and seasoned potatoes and onions and it's all baked to tasty perfection. 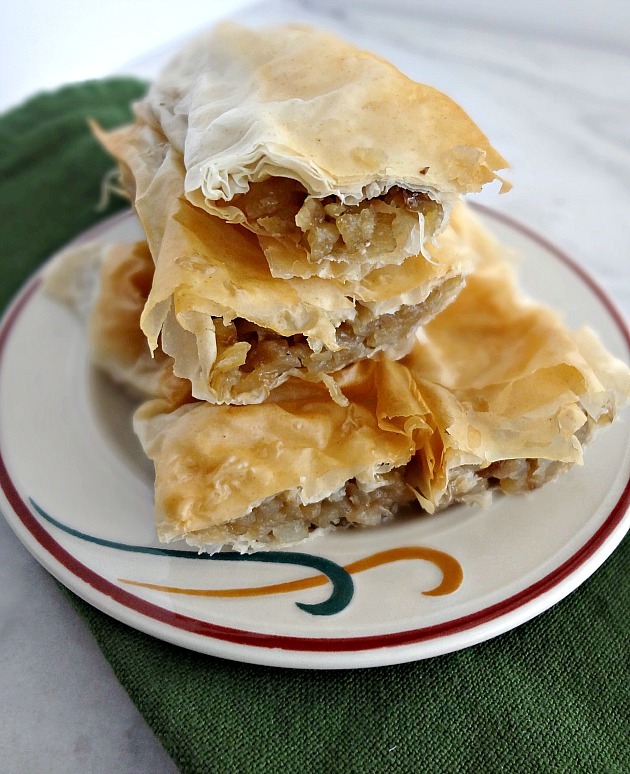 I think these are great especially as an entertaining food--because the recipe makes a lot, and there's something about phyllo dough that just screams "I'M FOR GUESTS!" to me *shrug*. Unfortunately we were not having any company when I made these so it was up to Michael and I to eat them all. And if any eaters were ever up to the task...it was us. They're quite delicious and I'm definitely keeping them in mind next time I need something to bring to a party! Preheat oven to 375F degrees. Prepare desired pan (you can use a square, rectangle, or circle--I used a 9"x13" casserole dish) by spraying with nonstick cooking spray. Heat oil in a pan over medium-high temperature. Add shredded potatoes and onions and season (with beef bouillon or other seasonings of your choice, and salt and pepper). Saute', stirring frequently, for about 5 minutes, until they look about halfway done. 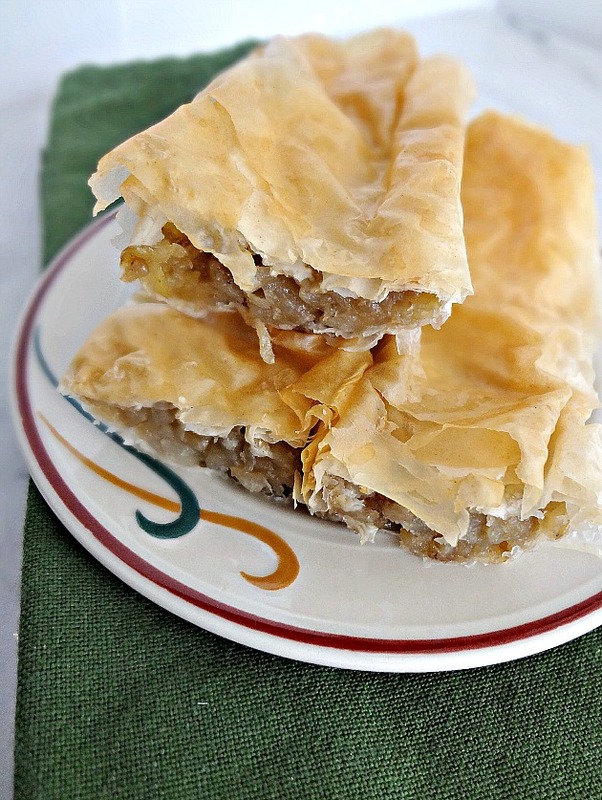 Carefully take 2 sheets at a time of the phyllo dough at a time and place on a clean and dry surface. Make a line down the center of the dough using about 2 tbsps. of the potato-onion mixture. Then fold the edges of the dough and the half of the dough closest to you over the filling. Roll away from you. Place the rolls in the prepared baking pan (if it's circular just snake them around the outside and work your way to the center, you can fit them however necessary). 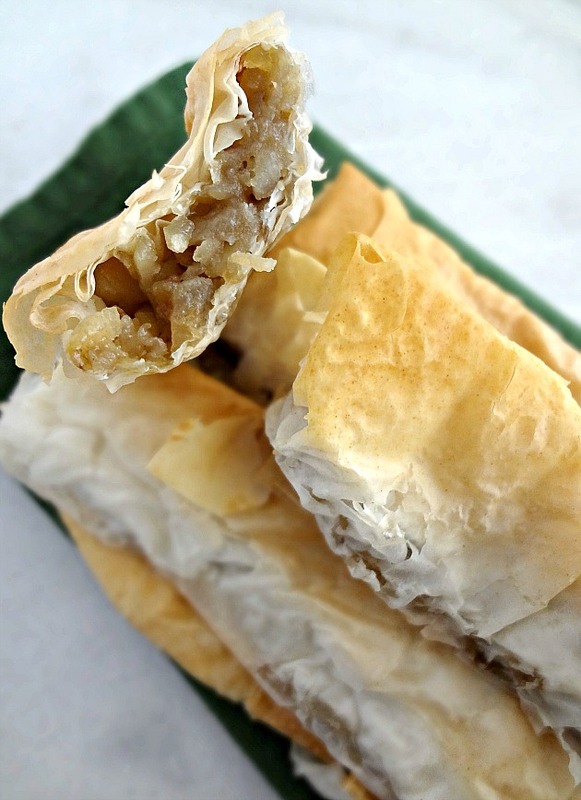 Repeat until all the potato filling is used up--if there are any unused phyllo sheets, put back in their container and refrigerate or freeze for future use. Brush the rolls with some oil and bake for 20-25 minutes. A few minutes before they're done spray or sprinkle them with a little bit of water and oil to keep them moist and crunchy. They're done when golden brown! Serve warm or at room temperature.